Snrky: Is that because you don't think you'll like the answers you're going to get? Is that because you don't think you'll like the answers you're going to get? Many of you know how challenging it can be to get buy-in from a group on a new project/idea. Competing priorities, politics, money -- it all comes in to play -- but what I'm learning is just getting your foot in the door isn't enough. The thing about convincing one or more people to get behind your project; it remains critical that you keep them behind you over time. Priorities change, finances change, markets change, organizations change, people change. That must be managed. But all of these external forces are nowhere near as critical as keeping your primary users (particularly on internal business apps) happy with the direction of the project. They, more than any other factor, can sink it. And sometimes it is hard work to keep them on board. Particularly the longer a project gets and/or when you might disagree about the best way to move forward when issues/problems arise. As much as you might want to follow Snarky's advice and simply ignore them, do so at your own peril. You're not really a people person are you? Title: Is that because you don't think you'll like the answers you're going to get? 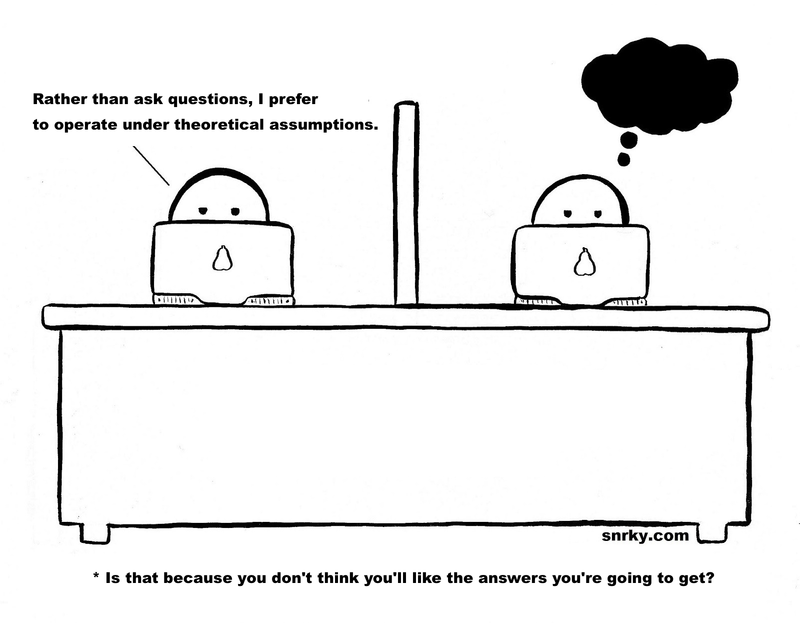 Snarky: Rather than ask questions, I prefer to operate under theoretical assumptions.